No More Corn In Your Crep! Let's tawk� Do you have chunks of corn in your crep? I ate a pound of organic corn on my salad last night and guess what? Next morning; no chunks of corn. Not even a slight trace. Totally digested. I did not chew exceptionally well, I ate rather quickly since the salad tasted so good. 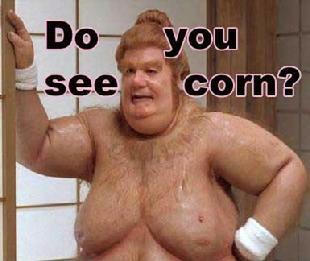 I can't remember the last time I saw any "chunks of corn" let alone any signs of corn in the toilet since I went raw. If I strain my brain and close my eyes I think I can recall a time when I did see the "undigested" remnants � but that was a long time ago when I thought I was eating "healthy". The HCL levels in your stomach acid are most affected by the overall condition of your immune system, which is most directly affected by how you eat. Make sure you have your dark green smoothies every day, such as greens such as kale, parslane, collards, spinach, and lambs quarters. Fruit is your main carbohydrate meal. When you eat right, all of your body functions will return to normal, which for most people will mean significant improvements in everything they experience. Digestion and assimilation improve drastically too. You can see it for yourself!